Tensions between the United States and Russia are heightened, but that shouldn't affect operations on the International Space Station, NASA chief Charlie Bolden said today (March 4). NASA's Mike Hopkins, Russia's Oleg Kotov and Sergey Ryazanskiy are scheduled to fly back to Earth aboard a Russian Soyuz spacecraft Monday (March 10). NASA officials are confident that the landing will not be affected by the current political climate, however. U.S. and Russian relations have been strained in recent days due to the ongoing situation in the Ukraine. Crews on the space station have weathered political situations like this one before, Bolden said. Shortly after Hopkins, Kotov and Ryazanskiy land in Kazakhstan on March 10, three more crewmembers will launch to the station atop a Soyuz rocket. 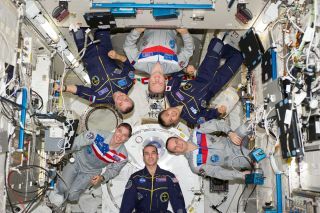 NASA astronaut Steve Swanson and cosmonauts Alexander Skvortsov and Oleg Artemyev, will depart Earth for their stints on the orbiting outpost on March 25. Currently, Russia's Soyuz spacecraft are the only vehicles that ferry NASA astronauts to space and back. NASA officials hope to change that in the future by using private spacecraft currently under development in the United States today. The U.S. space agency's Commercial Crew Program is designed to foster the growth of private spaceflight systems that may take astronauts into low-Earth orbit sometime in the near future. The space station has recently been granted a life extension until at least 2024. The $100 billion orbiting outpost is the largest manmade structure in space, and rotating crews of astronauts and cosmonauts have manned it since 2000. Five space agencies representing 15 different countries helped build the space laboratory. Editor's Note: This story was updated at 4:50 p.m. ET to include new comments and details from NASA Administrator Charles Bolden.